OCHSTIN 068A is a new fashion watch designed for men. High quality genuine leather strap, precise quartz movement, chronograph sub-dials, luminous function, perfect to wear in any occasion. 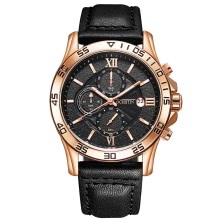 Good watch to express men&apos;s charm and taste. Sports styled watch, fashion frosted dial. Cool chronograph sub-dials: to display millisecond, minute, second at 12,9,6 O&apos;clock. Comfortable stitched genuine leather strap. It&apos;s 30M daily water-resistant(but not for swimming, showering). Well packaged with box, good gift.